SAFF U-15 women football team leaves for Bhutan - Integration Through Media ....! KATHMANDU: A 32-member women’s football team left here today for Bhutan to play in the Second U-15 SAFF Championship Women Football. The team comprises 23 players, three coaches, five officials and one sports journalist. Nepal is placed in Group B of the Championship which kicks off on August 9 and concludes on August 18. Along with Nepal, the defending champion Bangladesh and Pakistan are also in Group B. India, the host country Bhutan, Afghanistan and Sri Lanka are in Group A. This is the second edition of the tournament. Maldives is not participating in the championship. 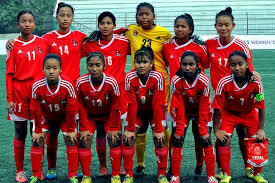 The players include Preeti Rai (captain), Sabitri Kisan (goal-keeper), Pooja Thapa, Karina Dhimal, Khusbu Rai (defender), Pushpa Gurung, Surakshya Singh, Sarishma Thapa Magar, Saloni Rana Magar, Sarita Neupane, Sabina Chaudhari and Mana Maya Pariyar. Similarly, Sushma Tamang, Riya Banu, Manisha Bista, Sabita Ranamagar, Poonam Ghimire, Asmita Chaudhari, Saraswati Hamal are in the mid-field line-up while Rajani Thokar, Nikita Thokar, Chandra Bhandari and Anushka Sherpa are playing as forwards. Chief coach Ganga Gurung, coach Shyam Manandhar and goalkeeper coach Binod Maharjan are also accompanying with the Nepali team. FIFA referee Asmita Manandhar and FIFA assistant referee Beena Shrestha is also going with the team to Bhutan to conduct the game. Nepal’s performance in the first edition of the Championship held in Bangladesh last year was not satisfactory. Nepal could not manage a single victory in any of the games it played that time. It faced a 6-0 rout to Bangladesh, a 10-0 humiliating defeat to India and drew 1-1 with Bhutan in the first edition of the Championship.